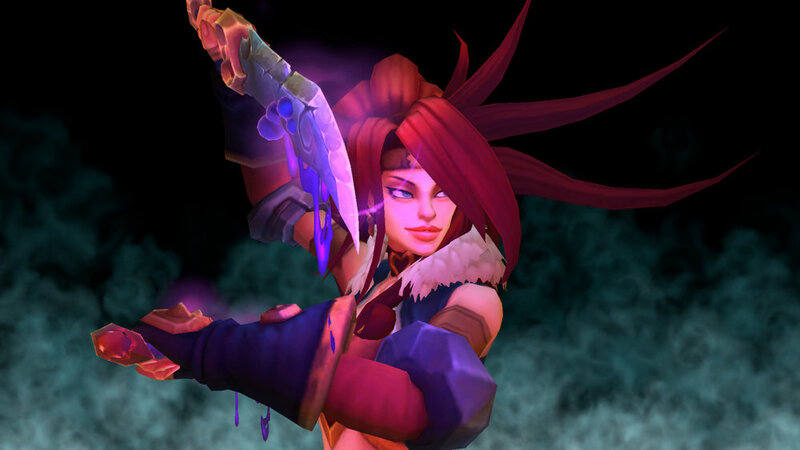 Fans of Battle Chasers, like myself, have been waiting patiently since 2001 for the next adventures of Gully, Garrison, Knolan, Calibretto, and of course, the curvaceous redhead, Red Monika. Apart from the announcement of this very game, it didn't look like we were ever going to see what adventures awaited our heroes next. The comic book the game is based on ran only nine issues, with only a sneak peak of its unreleased tenth issue merely there to whet the appetite for those begging for more. 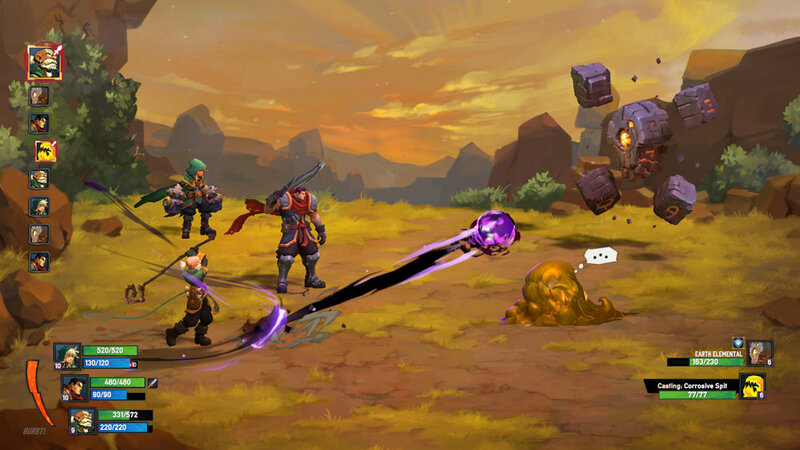 While Battle Chasers: Nightwar does let us join back up with our favorite band of heroes, it lacks the narrative fun I loved about the series, and yet, it is still an entertaining adventure mainly due to its visuals and addictive combat. 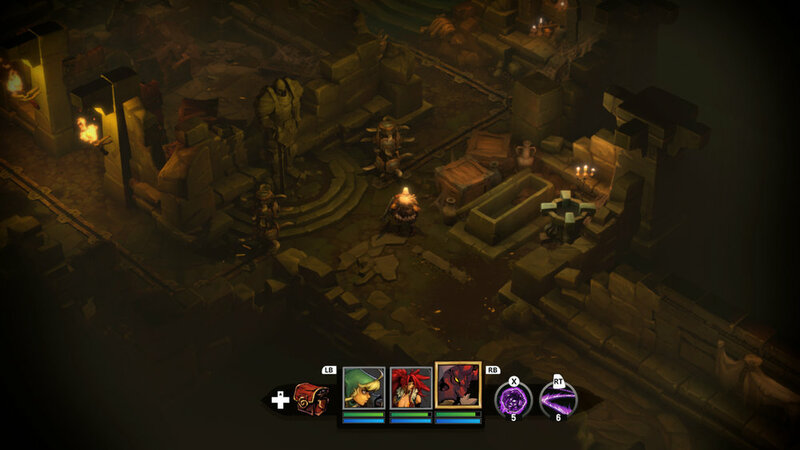 At first glance, it may be hard to pinpoint exactly what sort of game Nightwar is, as some screenshots show a Diablo III stylized dungeon crawler, with others showing the more traditional turn-based JRPG format, and it's both, sort of. While you'll explore the eight dungeons and other locations in a format more akin to an isometric dungeon crawler, the actual combat is a three on three turn-based affair, and apart from some minor gameplay and technical issues, the experience is mostly fantastic. While you start the game with Garrison, Gully, and Calibretto, you'll soon be joined by Knolan, Red Monika, and Alumon. Each of them fit within certain archetypes; tank, healer, rogue, etc. While Calibretto starts off as your healer, Knolan ends up filling the role a bit better until Alumon shows up and I found him to be far more effective as both a damage dealer and a healer. 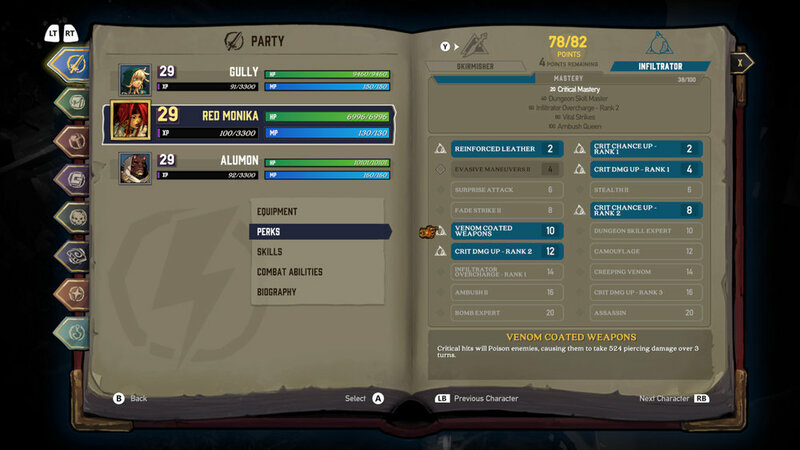 Each character has two different skill sets to work towards and what is interesting about this system is that you can remove points and respec whenever you want, allowing you to customize your party to fit your needs. The only issue I found with the skill system is that they will change location on your action bar as you unlock them, making it harder to remember where they are when you level up. It's a small nuisance, but one that I hope they fix. You'll always control a party of three and you'll choose from the aforementioned heroes, as well as the newcomer to the series, Alumon, who is a powerful addition to your team but also acts as a narrative device to always keep the heroes up to speed as to what is going on. You'll take said party to various locations and dungeons, and this is done via the overworld map, and while I'll talk more in depth about this map later on, It's one of the least impressive parts of the game. The side quest areas and the dungeons, however; are flat out gorgeous and are where you'll spend the majority of your time, for reasons both good and less good. There are eight dungeons to explore in the game with a small selection of bonus locations like a thorny maze, an old church, or a pair of graveyards, each with various secrets and treasures to collect. The dungeons can be completed numerous times at different difficulties and will drop far better loot for the added challenge. While I tend to leave my issues with a game till later on in a review, I really need to address my main issues with the game right now as it pertains to how the dungeons work and the absolute need to replay them over and over again. 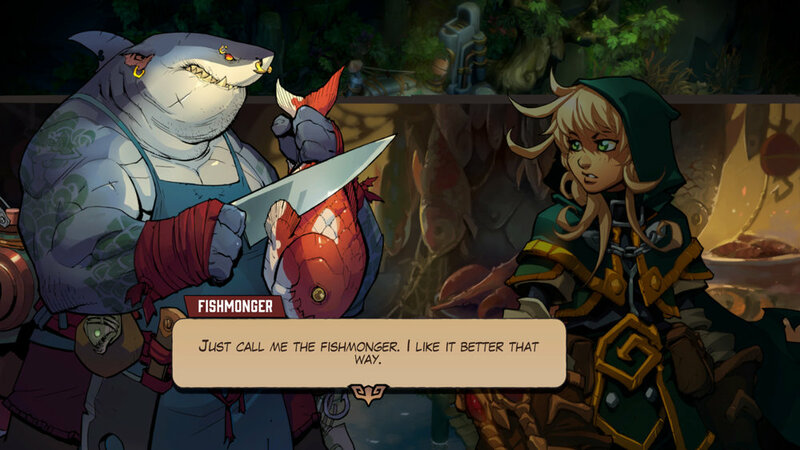 Battle Chasers: Nightwar can be a bit unfair in how often the difficulty ramps up between dungeons, forcing you to stop the story and replay previous dungeons or battle encounters over and over again. I had just completed a dungeon where the difficulty was challenging, but very possible to advance in and the following dungeon was then so frustratingly hard that I had to go back to the previous dungeon and level up my team a full two levels before I felt I had the ability to even survive what came next. While this doesn't happen as severe later on, I felt that during my 60+ hours with the game that at least a solid 20 hours of that was simply used to experience grind my characters to a point where I could continue. The grinding needed to advance my characters to a higher level to survive what awaited them was also the reason why I rarely chose to change my team up after a while. You can only have three members active in your party and the remaining cast won't earn any experience when they are not in your active party, meaning that should you want to swap out team members, you'll need to start the grind all over again. Once Red Monika and Alumon were available to me, I swapped them into my party, along with Gully, and never looked back. This system of experience blocking my benched characters really impacted my desire to want to use them. Had they gained experience at the same rate, then I could have changed up my party without the need of spending dozens of hours level grinding them to stay relative. While some gamers may relish in this aspect of level grinding, I just don't see the appeal, nor have the patience. While having to replay the same dungeons over and over again may sound a bit repetitive, and it can sometimes feel that way, the team at Airship Syndicate has that mostly covered. Each time you reset the dungeon, the format of certain elements in the dungeon will change and offer up new challenges, new puzzles, and a new layout to explore. Upon entering the Junktown dungeon a third time, again due to the forced nature of leveling up my characters to progress, I ran into a completely new puzzle that I hadn't seen before, which can be a very cool discovery when you think you've seen all the game has to offer. This added bit of bonus discovery isn't quite the trade-off to the need to keep repeating dungeons to earn enough experience to progress further, but it does break up some of the repetition, but just barely. In between dungeons you do have a few activities to keep you busy with several of them granting a bit of experience here and there. There is an arena where you'll take on waves and waves of enemies to earn experience and some loot as well as specialized boss battles called hunts. While some of these are simply go somewhere and fight a thing, one, in particular, has a very detailed set of objectives in order to even find the boss. Lastly, there is fishing. As you make your way around various dungeons, you'll encounter fishing ponds and you can collect fish to sell for currency to spend at a very specific store, the same place you can earn the alternate costumes for each character. As I mentioned at the start of the review, the combat is rather addictive, and that is due to a few key factors. Each character has a mana reserve that is used to power their special skills, and each skill will use up a certain portion of that reserve based on how powerful it is. As you use normal attacks in battle, skills that don't use up that reserve will net you what is called Overcharge. Overcharge is displayed in red next to your mana bar and works as bonus mana to use in battle. This can be very important should you run out of mana and any flasks used to refill that reserve. It is worth noting that this bonus mana will naturally go away after the fight is done. This Overcharge system is one of the best additions to the game and genre and one that I hope a lot of other games look to borrow from. Characters, both friend, and foe, attack in the order of their icons on the far left of the screen. This will show you who attacks when and if they have an attack at the ready. Enemies will also show what attack they have set up so that you can try to act as fast as you can within your turn, making combat far more strategic than your typical JRPG. Certain attacks will require more time to prepare and some are instant and can dish out smaller amounts of damage at the ready. There are attacks that can slow your foe and bump them down the timeline in order for your healer to unleash some last minute heals. It's a system that is somewhat similar to the Grandia series where working the timeline in your favor was a much-needed skill to survive. The skills that you use during battle, and this is mostly the ones that use portions of your mana reserve, can also come with a lot of stat buffs and status effects to make the most out of your time in battle. You can dish out some insane damage and leave an enemy poisoned, on fire, frozen, or bleeding. There are also skills that benefit from your enemies having these status effects and look to then do further damage because of them. This can translate into some killer attack combo's should you use one attack to cause the effects and another to then capitalize on them. That being said, these very same status effects can happen to you and flat-out destroy your party in only a few short rounds. Lastly, there are the Burst skills, which are offensive or defensive skills that are used after building up a Burst meter that any member of the party can use, as it is shared among the group. This meter will fill up during combat and its effects are instant, meaning you don't have to wait through enemy attacks to see its effects. These can be big elaborate attacks, or skills used to trigger some sort of defensive shield, as is the case with Gully. This shield is actually so good that it was one of the reasons Gully remained on my team and it was a skill I used nearly 90% of the time, coupled with Alumon's bonus damage Burst skill. The Burst skills also have some really fantastic animations to them as each character has three different skills to use, which means three different scenes showing them doing some pretty cool stuff. Each character will keep their look throughout the game and the only real change to their appearance, apart from the bonus costumes you can unlock, are through their weapons. Each character can outfit themselves with a weapon, a piece of armor, and various accessories that all of which contain various stat increases and can also be further enhanced with enchantments to further those stat increases. Given that this title started out as a Kickstarter game, before being picked up by publisher THQ Nordic, I'm sure this was a budget reason and one that I can totally understand, despite my issues with it, as it can lessen the appeal of the whole loot system. Crafting has been a staple in many games of late and Battle Chasers looks to join in on the fun as well. While the crafting system is fairly simple, it contains the ability to craft the item even when you don't have all the pieces, it just puts a percentage of luck if that item will craft. While I never tempted my fate with this mechanic, I did craft a lot of the items that my team wore right through to the final battle. While you can come across many of these items during your dungeon crawls, those who explore each and every section of the game will find the recipes needed to craft each character's ultimate items, one of which is called the Dragonkind, which was the name of a cancelled gaming project that team lead, Joe Mad, had originally worked on. Various NPC's around town will also sell crafting recipes, items, and the use of a workbench to do said crafting, and each shop can be upgraded with a large sum of gold, it is also worth noting that you can find these workbenches in dungeons as well. The game features a wealth of different foes and some fairly enjoyable boss encounters. There are giant skeleton knights to various blobs of slime, spiders, and some other interesting foes. The only issue I have with these bosses is that they start to work their way into the main encounters and this, at least to myself, lessen's their appeal and makes the repeated nature of besting them in the dungeons, even more repetitive. The rest of the enemy forces that you'll encounter are color swaps or small changes on existing foes, and while there is still a wide range of different types, some of the forces of evil start to blend together due to those small subtle changes, at least visually. One interesting aspect to the enemies in Nightwar is that once you defeat enough of a certain type you will earn passive rewards like increased stamina or haste. Each foe has a write up in the bestiary which will show your progress towards these goals. The same goes for any lore items you find as well. These little rewards really help when having to defeat several of the same enemies over and over again. The game, in some ways, is built around this repetition, so it's nice to see little things like this help when having to do some tasks over and over again. You'll run into enemies via dungeons and on the overworld map, where each encounter isn't random, it is initiated simply by coming into contact with each foe. In dungeons, you have certain skills that are exclusive to each character that can alter how the fight goes down or used to reveal secret locations by bashing down walls to locate them. These skills vary from character to character and can be used to lower the health of a foe, confuse them, or trigger stealth to sneak right by them. I found that unless it was a type of enemy that usually would destroy my team, like the late game Gargoyles, I didn't really come to rely on these skills to use on the more easier enemies as each attack didn't really seem to drop their hp a whole lot. Had these skills dished out more damage or protection, for how many times you can use them before you need to recharge them, then I probably would have found them far more desirable to use. The nine-issue run of Battle Chasers was memorable and despite the series ending with a huge cliffhanger, which is sort of ironic considering the publishing brand was actually called "Cliffhanger" it takes place years after and feels like an isolated moment in time more so than any continuation of what came before it. While that is great for newcomers, it is a bit less so for those who were wanting to see what happened next, but maybe that is where the comic series will go now that Joe Mad is producing a few more issues due to a Kickstarter goal. The story here is not as good as I had hoped, and despite some fun interactions between characters during the moments at the Inn or between a few missions, the narrative is fairly thin and forgettable and our heroes are never put in any real danger. There is a big bad that needs to be put down and stopped before they become too powerful, but the story falls into many predictable tropes that make it very easy to put the pieces together well before they happen. There are animatic style cutscenes between missions but they fail to impress after the game floods you with gorgeous visuals like the opening animated cutscene and the remainder of the game's look and feel. Had these scenes, which are mostly still images, been as good as the character art, well, that would have been something incredible. While the game itself is really pretty, mostly due the impressive environments and character art, the overworld itself feels lazy and tacked on and doesn't share in the same visual sense as the rest of the game. There is a slight 3D look to some of its elements but it doesn't feel like it belongs in this game and stands out in a rather poor way. The characters, the dungeons, and even the menu's themselves are great, look great, and truly shine in every aspect of design. I love the way each character moves or the animations during their skill bursts, and even when an enemy falls to the ground, it all comes together as one impressive package. For the first time ever, there are now voices attached to these characters and frankly, only some of them work really well. While I was never was one to attach a voice to any specific character, like fans of a novel hating a casting choice of a live action movie, several of these voices just don't really seem to fit the characters. There are moments here that certain actors completely nail, but I found many moments where the voices change slightly, and I am not sure if it's because of an actor recording various lines over the course of the development, or whatever it could be, but many of the voices lack consistency. I also found that a few characters were either too high-pitched, like Calibretto, or lacked the seductive nature of the character, like Red Monika. There are a few musical tracks to accompany you into battle and I wish there were more. I do enjoy the music, but so many of the tracks are repeated so often and they start to lose their appeal very quickly. Apart from some story elements, the difficulty spikes, and the overworld map, there is only one final issue that I had with the game; the framerate. Often, and I mean really often, the game would drop frames considerably. While it never happened during a do or die moment in battle, it still made exploring dungeons a bit less impressive when the game starts to stutter considerably. As the game has not yet been released for the Switch, I am curious as to how the handheld portion of that game will run. 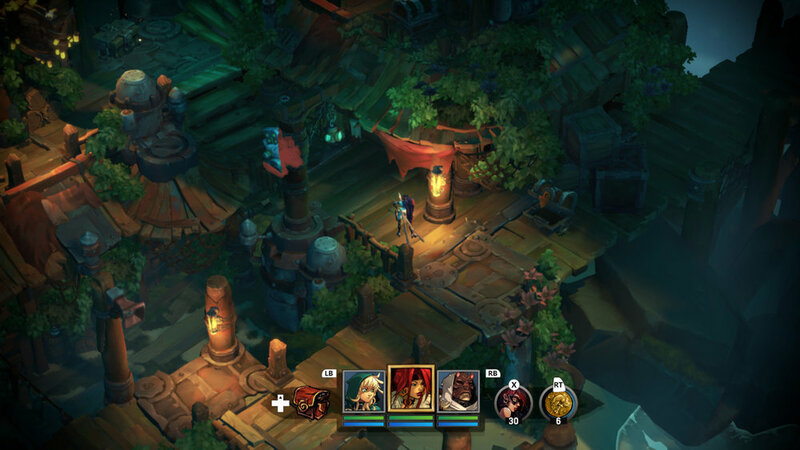 Battle Chasers: Nightwar, despite any issues I have with the game, is still a very fun and engaging experience. It's incredibly fun to see these characters back and while I wish the story was a bit better, mainly because the comic book its based on was so good and still holds up, it does have its moments in the character interactions. When I heard the game was looking to be funded through Kickstarter, I instantly logged in and put money towards it. I've seen the game at Pax twice now and even had the chance to meet the man himself, Joe Madureira. I am a huge fan of Battle Chasers and didn't want that bias to influence my review, which is why I am being so critical of it. There are obvious flaws present in the game with many of them already being patched or addressed, and with the title being budget priced at under $30, it is a low-cost investment for a whole ton of fun. 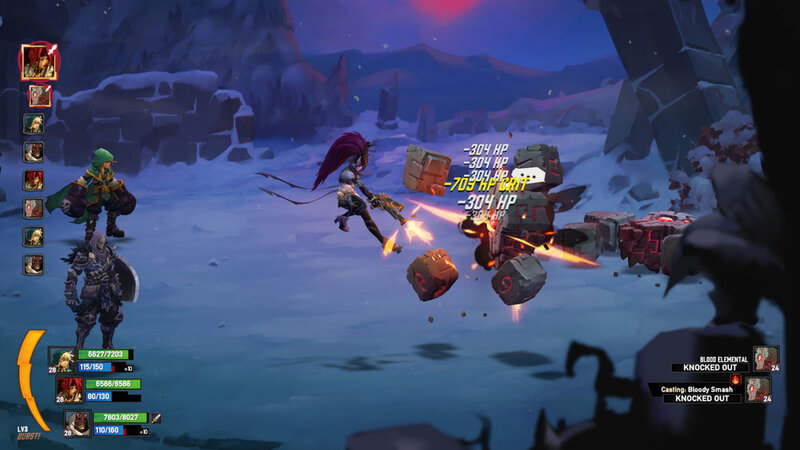 battle chasers: nightwar was purchased via kickstarter.